Extremely tricky to climb due to a lack of footholds. Does not require regular maintenance work or repairs. Galvanised but can also be powder coated. Offers privacy without compromising on the visual appeal of the premises. High rust and corrosion resistance. When you browse the palisade fencing options on our website, you’ll see that we can supply them with ‘W’ or ‘D’ sections. The 'W' section is preferred to the more traditional 'D' section as it offers increased security. This is because the fastener head is more concealed and therefore rather difficult to tamper with. The 'W' pale itself is a stronger more robust profile, but whatever type you decide on, we offer a choice of heads, including rounded, rounded and notched, single pointed and triple pointed, whilst you also have the option to polyester coat the system to a range of standard colours including black, white, grey, green, red, blue, yellow and brown. Placing an order with Aaron Fencing is easy. 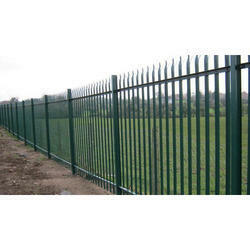 When you’ve decided on the type of palisade fencing that’s right for you, simply select a height that suits you. Standard heights you can choose include 1.8m, 2.0m, 2.4m and 3.0m, whilst run options include 50m, 100m or 200m with all of the component parts included. Of course, should you need a quotation for a different height, run or quantity, you only need to give us a call. We also supply matching single leaf and double leaf gates, but these too can be made to order if desired. 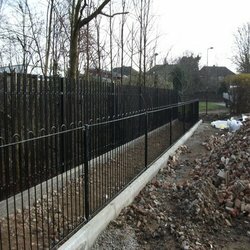 If you’d like us to install your palisade fencing in Peterborough, we’d be glad to help and you only need to read through some of our installation examples to see what we’ve achieved for our clients in the past. All of our installations use the best quality pre-treated materials, ensuring that the work we carry out will offer you the greatest value for money possible, with an unbeatable service. So, whether you are an agricultural, commercial, educational or residential customer, we’re more than confident our installation process will offer you a smooth, well-planned project with excellent end results. We’re an approved supplier for Tesco, Luton Borough Council and the NHS which is a testament to the level of quality and security we maintain. So if you’re looking for a solution that’s highly strong, cost effective and built to last, palisade fencing can be the ideal solution for you. With teams of trained fitters, each with a vast amount of experience, we can ensure a perfect installation with a service that is second to none.